Keeping your own horses requires dedication, hard work, and a sincere interest in the well-being of your animals. This practical guide shows you how to design efficient facilities and establish effective maintenance routines so that your horses can stay happy, healthy, and safe on even the smallest plots of land. 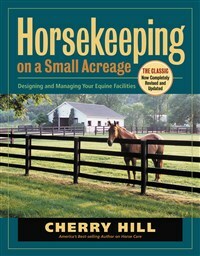 Offering expert advice on barn designs, fencing options, and pasture management, Cherry Hill stresses the importance of understanding horse behavior and environmentally responsible land stewardship as integral aspects of a pleasurable and rewarding horsekeeping experience.